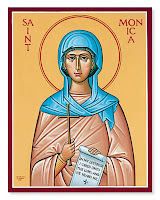 Tomorrow is the feast of St. Monica with the feast of her son, St. Augustine, following the day after. We aren't doing any formal geography this year, but a globe, some wall maps and Google Earth are going to help us explore the place of St. Monica's birth (Algeria) and the place she died (Ostia, Italy). I was looking for recipes that might be appropriate for celebrating St. Monica and her son when I came across this Algerian dish. It just so happened that last week, I decided to reintroduce a similar dish I hardly make any more because the children were never very fond of it. Now that they are older, I know I can coerce encourage them to give it a fair try. My recipe, bearing a striking resemblance to the Algerian version calls for zucchini, chicken, tomatoes and couscous but no chickpeas. I don't see why you couldn't add them if you wanted to. Season chicken thighs with garlic salt and pepper and brown in olive oil. Remove from pan. Saute zucchini in remaining oil and pan drippings. Add tomatoes (use two cans if you want more tomato in the tomato/zucchini ratio, I prefer more zucchini) and bring to a boil. Return chicken, cover and simmer until chicken is done. Serve over couscous. As you can see, it isn't really a recipe, rather just a set of instructions. You can play with it and add seasonings that you know your family will like. Also, here is a coloring page I made for St. Monica and here is one for St. Augustine. Please feel free to use them with your family and/or friends. Exemplary Mother of the great Augustine, you perseveringly pursued your wayward son not with wild threats but with prayerful cries to heaven. Intercede for all mothers in our day so that they may learn to draw their children to God. Teach them how to remain close to their children, even the prodigal sons and daughters who have sadly gone astray. Amen. Even though it looks complicated, it actually sounds fairly easy.... You won't even need a cookie cutter with this pdf template to use as a pattern. Enjoy! 1. Knead the flour into the cookie dough to firm it up. On a floured surface, roll the dough into a 1/4-inch-thick rectangle. Using the template, cut out as many cookies as you can. (If you happen to have a small heart cookie cutter you can use that as well.) Keep rerolling the dough scraps and cutting until you have 12 cookies -- 11 for the cake plus a backup. Transfer the cookies to a foil- or parchment-lined baking sheet and sprinkle them generously with yellow sugar. Bake them according to the package directions until they're golden brown around the edges. Transfer them to a wire rack to cool completely. 2. Spoon 1/2 cup of the frosting into a resealable plastic bag. Snip off a corner of the bag and pipe designs onto the cookies. Add candy decorations as shown above. Allow the frosting to set for at least 1 hour before handling the cookies. 3. Use a long serrated knife to trim the top of one of the cakes flat, if needed. 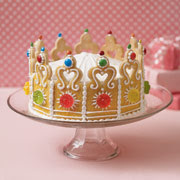 Place it on a serving platter, spread a thin layer of frosting on the top, then lay the other cake on it, rounded side up. Generously frost the stack and use a spoon to draw the frosting on top up to a point as shown. Carefully press the cookies around the side of the cake, piping lines of frosting between the cookies to secure them. Serves 11. Mary, Queen of Heaven ~ Pray for us! UPDATE: You can see my finished cake here. We wanted to celebrate Our Lady's feast day today, so I got creative with my raisin bread recipe. I make this recipe often (tripling it for our family of 10), but today I did a little something different. I just made little balls of dough, rolled them in melted butter and then in a sugar/cinnamon mixture. I put them side by side in my Pampered Chef muffin pan (I love PC! ), and after rising a bit, baked them up. I told the kiddos that the bread is rising, just like Mary did today. It is sweet, just like the love between Jesus and Mary and the two pieces joined together are just like them going up into heaven, when Jesus came to get His mother and take her to be in heaven with Him, body and soul. In a small bowl, sprinkle yeast over 1/2 cup of the water. Stir and set aside to soften, about 5 minutes. In a large bowl, combine 5 cups of flour, salt, cinnamon, and sugar. Add the yeast mixture, remaining 1 c. of water, and the butter. Stir until all ingredients are moistened. Knead the dough in the bowl until it forms a ball. Sprinkle work surface with 1/2 c. flour. Turn the dough onto the board and knead until it becomes smooth and elastic, 3 - 5 minutes. Gently knead the raisins into the dough. Lightly oil a large bowl. Shape the dough into a ball and place it in the bowl, turning to bring the oiled side up. Cover with a clean cloth, and let the dough rise in a warm place until it is double in size - about 45 minutes. Form into loaves (or make the muffins, as described above), place into greased pans, and let rise again for 45 minutes. Bake in preheated oven at 350 for 50 - 60 minutes (30 minutes for the muffins). 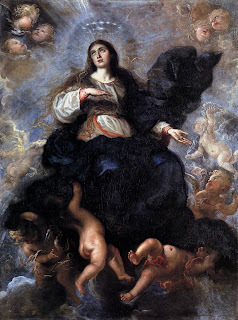 August 15 marks the Solemnity of the Assumption of Our Lady into heaven, a holyday of obligation. In the Eastern churches it is called the Dormition, or sleeping of our Lady. I had lots of ideas for this day, but my planning time was usurped by family matters and upcoming events. I don't have pictures to share for these recipes, but you can use your imagination. The most notable tradition on this day is the Blessing of Fruits and Herbs, although in some areas the blessing includes wheat and specifically, grapes. This is a first-fruits feast, a feast reminding us of the Old Testament offering to God the best of their beginning of the harvest. So for this feast, I'm incorporating fruits and herbs in my dishes. I like to make this Assumpta Salad with our fresh tomatoes, technically a fruit, with lots of herbs. This recipe is by Brother Victor-Antoine d'Avila-Latourrette from his Twelve Months of Monastery Salads. I love this cookbook, particularly in the summer. "This enticing salad is always served as an appetizer. It is one of our favorites for the feast of Our Lady, and we especially like it on the Feast of the Assumption on August 15, when garden tomatoes are at their best." Whisk the vinaigrette ingredients together until thickened. Let stand for about 1 hour before using to steep the garlic. For the salad, arrange tomato slices on 6 to 8 salad plates. Sprinkle the onion and olives among them. Sprinkle the herbs evenly, then add the cheese cubes in the middle of each dish. Whisk vinaigrette just before serving and drizzle evenly over each plate. Serve immediately. I love to grow herbs -- they are actually a lazy gardener's (or busy mama's dream), as they are so low maintenance. I am going to make a bouquet of some of our herbs (and flowers) and have a family blessing, and then incorporate some of our harvest of fruits and herbs into food and crafts. One plant we have and enjoy is lavender, known as Mary's Drying Plant (rosemary has a similar title). One doesn't normally think of eating lavender, but the flower is edible. I thought a sugared lavender flower and lavender cookies would be an easy treat to make. This recipe can be found in Herbs for Weddings & Other Celebrations by Bertha P. Reppert (first printed as A Bride's Herbal). Cut just the flowers from the stalks. Dip the sprigs in beaten egg white. In a separate bowl then roll or dust on granulated sugar. Air-dry on waxed paper. Makes 1 dozen edible flowers. I found several versions of Lavender Cookies in cookbooks, including Susan Branch's The Summer Book and the Internet, such as this recipe. The variances are many, but generally I'm finding either shortbread, sugar, or butter cookie dough as the base for the recipes, then add lavender. Some call for dried flowers, other fresh. I think I would prefer using fresh flowers, rather than crunchier dried ones. For my son I was going to use an allergy free sugar cookie mix for my son and add some fresh lavender flowers. Having the cookies and edible flower bites would make a lovely dessert display, also perfect nibbling food for tea. Or I may take an even simpler route, make a dessert (with icing) and decorate with flowers and herbs. All in the spirit of honoring Our Lady! In a large skillet or electric frypan, fry bacon until crisp. Remove and set aside. Add onion to drippings and saute until golden brown. Cook kielbasa in boiling water for 15 minutes. Drain and cut into 1/2" slices. Add kielbasa and red peppers and stir over low heat for another 10 minutes. Season to taste with salt and pepper. Pile on a serving platter and sprinkle with reserved crisp bacon. In a large bowl, beat together eggs, carton sour cream, and salt. Stir in flour and warm water. Add water until dough feels like velvet. Turn out onto a lightly floured board, and knead until smooth. Roll out to a 1/8 to 1/4 inch thickness. Cut out 3 1/2 inch circles with either the top of a glass or a biscuit cutter. Cover with waxed paper to prevent drying out if not filling immediately. Place 1 or 2 tablespoons filling on one side of a circle of dough. Fold over, and seal by pressing the edges with a fork. Repeat until ingredients are used. Bring a large pot of water to a boil. Immerse pierogi. Cook until the dumplings float to the surface. In a large bowl, mix together mashed potatoes and shredded Cheddar cheese. Season with salt and pepper to taste. As part of my planning for our upcoming school year, I was, just this morning, putting together a list of our family's Patron Saints-- something I hadn't done before, and so was not aware of the actual dates of each Patron Saint's feast. One of them is St. Lawrence, who, had it not been a Sunday, would have had his Feast Day, today! St. Lawrence, who was martyred over an open flame (and is famous for quipping, "You can turn me over now, this side is done!") is the patron saint of cooks! Perhaps you might present your cares to him for his special intercession, as you're preparing meals for your family today. This is an adaptation of an earlier column from my blog. August 8 marks the memorial of St. Dominic, priest, founder of the Order of Preachers. As this is a special family day that marks birthdays and anniversaries, I like to give a little recognition to this saint who has become part of our family feasts. 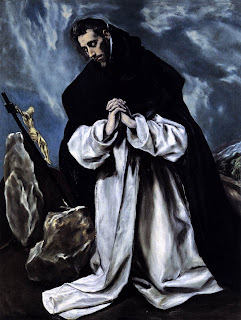 St. Dominic was born in Spain, but fought Albigensianism, a Christian heresy in western Europe. Father John Hardon has an excellent explanation of Albigensianism. The main reason so many people were being drawn into this heresy was plain ignorance. So his mission was preach the Truth of the Gospel. 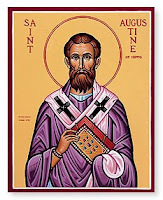 For this saint's feastday, we're keeping it simple, since penitence was a focus in his preaching. I'm going to trace back to Dominic's Spanish roots and use a recipe from my favorite Spanish cookbook My Kitchen in Spain by Janet Mendel for the main dish. My tomatoes are ripening and this recipe is perfect for using some of those luscious fruits, Chicken Sautéed with Fresh Tomato. Accompanying this I will have brown rice, a simple green salad and fresh fruit salad for dessert. The fresh tomatoes have a sweeter taste than most Italian tomato dishes. I realize the cooking time is lengthy, and I actually shortened the tomato cooking time without loss of flavor. Heat the oil on medium high heat in a deep skillet, then add and brown the chicken pieces, about 10-15 minutes. Remove when browned all over, and drain extra fat except 2 tablespoons. Blanch and peel the tomatoes. Seed the tomatoes and chop coarsely, making 5 1/2 to 6 cups. Heat remaining oil in skillet on high, add all remaining ingredients except parsley. Cook for 5 minutes, then add the chicken back to the pot. Lower heat to medium and simmer uncovered, about 45 to 75 minutes. Remove the chicken when done, but continue cooking the tomato sauce over medium heat until very thick and beginning to brown, about 30 minutes longer. Add chicken back to the pot to reheat. Remove bay leaves, serve garnished with fresh parsley. Note about pimentón, or smoked paprika: Apparently, there really isn't a true substitute for the Spanish paprika. It's not the same as Hungarian paprika at all. Only one place suggested sweet paprika and then add cayenne for some heat. See Smoked paprika and European spices for further information. I made this last time, omitting the pimentón and the flavor was quite nice. Another sidenote on St. Dominic. He's the patron of scientists, seamstresses, and astronomers. Star fruit would be in order to add to our fruit salad. I hope to eat out on the screened porch since the day is so beautiful (fall like). Perhaps we'll do some sky-watching. Although the Perseid's are also known as Tears of St. Lawrence, since they generally coincide with his feast day, the feast of this patron saint of astronomy has perfect timing! 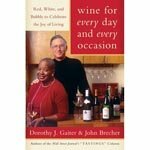 All their books are quite practical and easy reading, helping the ordinary man enjoy wine. There is no snobbery involved, but just help in understanding a bit more about wine, and making memories. I never had the opportunity like Mary Ellen, so I'm no expert, but we do enjoy the adventure. Wine was used for the institution of the Eucharist, at the Last Supper. Now it is daily used at Mass all over the world, before it is transformed into the Body and Blood of Jesus. I also love to think about Our Lord's first miracle at the wedding feast at Cana. Jesus and his mother were probably at a celebrating with family or close friends, and wine was a necessity, not a luxury! It was part of the social feasting aspect. What more blessing can we have for enjoying wine in social gatherings? I have a few unorthodox suggestions for expanding and trying different wines, and incorporating them into family and feast day celebrations at home. Of course wine connoisseurs may not agree with some of my suggestions, but truly, we've found some very fine wines this way. It's fun to experiment and wander away from the usual standards. First start reading about different types of wines, the varieties from various regions in different countries. What piques your interest? Sweet wines? Bold reds? Dry white wines? Traditional varieties, or the new grapes? What countries do you want to "visit"? After all, wine doesn't only come from France and California. Then have fun trying out different wines. In my local area Trader Joes, Costco, Total Wine, and even Wal-Mart have many wines priced very reasonably, so one can experiment without breaking the bank. Read labels and descriptions and pick something that appeals to you. I'm in no way advocating buying "Blue Nun" for a blue bottle for a Marian feast or a sister's habit for a nun's feast day, but if some of the choices do come down to a choice of a label, go with what appeals to you! There are hits and misses, but the madness of this method is for a twofold purpose: enjoy the wine, and get to know a saint more deeply. Follow the feasts in the Church that incorporate wine and blessings. The older form of Roman Ritual contains several blessings for wine or the New Roman Ritual. There are specific feast days officially connected to the blessing of wine, such as the feast of St. John the Evangelist on December 27 and St. Blaise, February 3. There are also local church traditions connected with wine, such as the upcoming feast of the Transfiguration in Rome. In France on St. Martin of Tours, November 11, Beaujolais Nouveau is drunk. Both celebrate the new wine in various stages. There are also annual blessings of grapevines in spring and of the harvest of grapes in the fall. Find a winery or type of grapes grown near where the saint was born or lived, or even where his remains are held. It's fun to pinpoint the region of origin or mission territories or relics of saints. Finding out about the wine of the region helps one understand the local climate and geography. Arid and dry? Very wet all year? Mountainous or coastal? I find I can understand the saint and his daily hardships when I learn about where he/she lived. How about a Spanish saint, such St. Josemaria Escriva, who was born in Barbastro, Spain? He was born near the Somontano Region, which produces several varieties of wine. For more Spanish ideas see Spanish wine and map of regions. Cava, port, and sherry would also fit into the Spanish heritage. Frascati, a refreshing white wine, would be perfect for any pope's feast day, particularly those that fall during summertime. While on a trip to Rome, we had a day excursion nearby the pope's summer residence, Castel Gandolfo. We enjoyed with our dinner the local wine, Frascati, and found out that it is a favorite with Romans (including the Pope) during the summertime. St. Robert Bellarmine was from Montepulciano, which is a town in Florence, but also a type of wine grape is from that area. Find the type of drink from time period of saint or an old winery that dates from around time of saint. Since the majority of saints on the calendar are mostly from Europe, the choices will generally be European wines. But Blessed Junipero Serra is an outside example. He founded many of the older vineyards during his mission work in California. 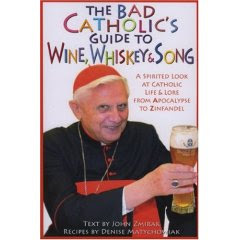 According to the fun book The Bad Catholic's Guide to Wine, Whiskey, and Song: A Spirited Look at Catholic Life & Lore from the Apocalypse to Zinfandel by John Zmirak and Denise Matychowiak, Mission wines have been used in the United States since 1769. The priests needed wine to say Mass, so they planted their own vineyards. Angelica is the first variety produced. "Private companies raising the old Franciscan grapes include Robert Mondavi and Gallo. Angelica is often bought by churches for use as altar wine at Mass by priests..." (By the way, I highly recommend The Bad Catholic's Guide to Wine, Whiskey, and Song. Don't be put off by the title. The book is sometimes irreverent, but nothing sacrilegious or contrary to the faith. It's an A to Z approach to various beers, ales, wine, etc. with short lessons on the Catholic Church, the Catechism, history, and culture. It's delightfully written and has good recipes, too.) Loosely one could use American Mondavi or Gallo wines to cover feasts like the angels, Saint Anthony, Saint Francis, Saint Junipero Serra and any other saints used for Californian missions. Find vineyards/wineries named after saints, feasts, religious orders, popes, maybe same country of origin. We've tried California's Franciscan for Franciscan saints, Italian Feudi di San Gregorio for our family's name saint, St. Gregory and other Italian saints. One special treat wine for us is Châteauneuf-du-Pape. According to Zmirak, "[t]his spicy, dense variety of wine is usually red, and typically excellent". The name means "the pope's new Chateau or Castle", with the papal keys usually found on the label. The vineyards were established during the time of the Avignon Papacy or Western Schism. So I would consider using this wine for a) French saints near this region, b) for saints like St. Catherine of Siena, who worked so tirelessly to bring the pope back to Rome, and also for c) Papal saints, just because the visual of the papal keys on the label is great for discussions. Match the wine to the type of personality of the saint. For St. Jerome, St. Paul how about fiery, red, bold wines, like Zinfandel? For St. Therese the Little Flower seems fitting to have a dessert or sweet wine. St. Francis and St. John Bosco seem so fun and joyful that a bubbly or sparkling wine would imitate their personality. And for St. Augustine or St. Thomas Aquinas, it seems only a scholarly port would do. Choose a seasonal saint wine. Consider cool whites for summer saints and reds to warm oneself during the winter months. Also consider Wassail or mulled wines for those cold times. Have the liturgical colors reflected in the wine. For feasts of Virgins, Popes, serve white wines. For feasts of Martyrs, Apostles, Bishops and Cardinals, serve red. For the Solemnity of Pentecost, serve red wine. For the Solemnities of Easter and Christmas and Epiphany, serve white and maybe white sparkling wine, like Champagne or Cava. It does go against our family tradition to suggest whites for the high feast days, because our favorites are reds, and for big feasts and family events, red is the wine of choice. We just spend a little more for a fancier wine. It looks overwhelming written out, but I'm really not suggesting anything out of the ordinary or difficult. It's the process and the enjoyment of wine in a social setting that's fun.